Want dine with your real friend and leave your cell phone somewhere secure? Or create an environment that allows your customers really enjoy each other? FixtureDisplays cell phone ipad mini charging station lockers mail slots are ideal for use in gyms, health clubs, government buildings, schools and other settings where small items need to be securely stored and be charged on time. 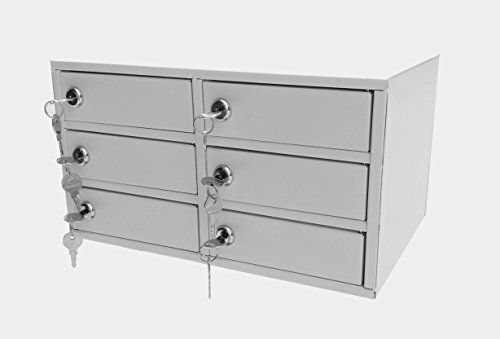 Constructed entirely of steel metal with grey coating, cell phone lockers can accommodate cell phones, iPads, wallets, keys, cameras, tablet PC's and other small items. Size :14.2"L x 9.4"W x 8"H, 6 compartments, 6 unique keys and locks. Each slot measures: 6.3"W x 2"H x 8.3"D. Each slot is equipped with a 110V charging outlet, so users can plug in their own charging device with ease. Slot is tall enough for hands to go in to access power and content. Administrator access via the back panel lock and keys, to put assignments in, or help a careless user who might lose their keys. To avoid users lose both keys, we recommend you order one of our key box, to properly store all the spare keys. If a user lost his/her key, you can quickly duplicate the spare key and avoid the trouble of losing both keys. We offer larger lockers as well. Browse our store for more items! Key boxes and Tags are listed and available in my amazon store. ASIN number is: B017D5QKXK and B00OZTSX2Y .